We have made suggestions boxes for each class. If you have any ideas you would like us to discuss then put a note in the box and we will discuss it at our next meeting. Lots of children have asked for football nets already. We have mentioned this to Mrs Smith and she is going to talk it through with the school govenors. We have designed and produced a leaflet all about our school. We hope you like it! Mrs Warburton is going to distribute the leaflet for us. We thought it would be nice to invite the Mayor to watch our Harvest assembly. She thoroughly enjoyed her visit and sent us an email to tell us. We even made it into the newspaper! Christina and Leon visited Haworth Art Gallery where the Mayor of Hyndburn was planting a tree in recognition of the Queen becoming the longest serving monarch. They had the opportunity to speak to the mayor, sign the guest book which will be sent to Buckingham Palace and had lunch. It was a morning. As I'm sure you are aware we still have road safety issues on Cartmel Avenue. The School Council have been working with our local policeman to think of ways in which we could help. Christina has written a brilliant poem which all children will receive a copy of next week (wk. beginning 2.2.15) and on Thursday 5th February we will be stood outside school with our banners and posters to encourage everyone to think carefully about where they drive and park near school. We are doing this for the safety of YOUR children, please help and support us to try and put an end to these problems. Our visit to Springhill Car Home was very successful We sang Christmas carols for the residents and handed out our cards, Father Terry also joined us and gave a blessing. Our cards were gratefully received and everyone enjoyed our visit. Thank you to Mrs Leyland who helped make this possible. On Thursday 18th December School Council will be visiting Springhill Care Home to distribute Christmas cards to the residents that we have been busy making. We are really looking forward to spreading some festive cheer and will hopefully get chance to sing a few carols too. We have been busy making our cards to show sympathy and compassion to people in our local community. Thank you to Father Terry for your help too! Update: We have received lots of fantastic replies from the people we have sent cards to already telling us how much they appreciated them. We really enjoyed opening these and it makes what we are doing all worthwhile! Thank you. The School Council are taking on the role of 'Value Champions'. Our values for this half term are 'Sympathy and Compassion'. If you know anyone at school or in the local community who might need our support or cheering up with a card please let one of our members know and we will try our best to help! Thank you. As you will know Children in Need is Friday 14th November and the theme is to dress up as a hero. Wristbands will be on sale from Monday 10th for £1 and buns will on sale on Friday 14th for 20p. Check out the posters around school for more information. Please bring lots of money to help support this brilliant charity. We are happy to tell you that our friends at St Pauls have accepted our invitation and are looking forward to watching the dress rehearsals of our Christmas plays. We need to get busy practuising and perfecting our performances now! 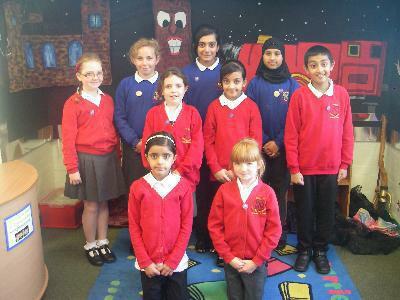 Yumna, Juwariah and Lydia (Year 6) Christina and Amisha (Year 5), Aahad and Anika (Year 4), Holly and Katie (Year 3). If you have any suggestions or ideas please let your class council members know or use the 'Suggestion Box' in class. Check out this link all about school councils! School Council have designed lots of posters as part of the '20s plenty' campaign. These have all now been sent off and are being made into a huge banner that we will display on the school fence. We are all very excited about it and hope it arrives soon! The grafitti artist has now been in school and completed his design with the help of all of the children. A big thank you to those children who gave your class council members ideas for the design and those who designed posters. This was really helpful. We hope you enjoyed the fantastic opportunity of helping to complete the design. Our 20s Plenty poster has now arrived and displayed on the school fence. We think it looks great and hope it makes a difference. Can you see your design on the poster?! We all had a fantastic day rasing money for Derian House in memory of our friend Tauheed. Ayeesha and Alvi wrote a report all about it, read it on our display board.